Home / Shop / Video / Streaming / Use Your Head & Turn! Spotting, Pirouettes from Fifth, Pas de Bourrée Turning. Levels 2 & Up. All Regions DVD. 98 minutes. 20 exercises. Whenever the best dancers pirouette and change directions, they turn their head quickly with eyes sharply focused—this is what makes their dancing so enjoyable. As you might imagine, it’s not easy to keep your balance when you must pirouette or turn your head quickly and move across the floor. In the same way you practice moving your feet and legs faster, you must also practice moving your head. This video shows you how to keep your balance when you spot quickly; details the correct use of the feet and arms when you pirouette from 5th; and teaches you how to turn your pas de bourrées with control and elegance. Each exercise is shown step-by-step by Finis Jhung, demonstrated by Sachiko Kanai, analyzed with corrections, and repeated. The wealth of information is staggering—welcome to ballet heaven! The CD music is by Scott Killian. “Finis delivers what he promises—and then some! “Having now studied with Finis’s DVDs for over a year, I have grown to expect much from his productions: aesthetically, pedagogically, and of course with regards to technique. Yet, this DVD surprised even me. “Second surprise has to do with just how much Finis has packed into this DVD. Once more, I feel that the title does not do justice to the amazing content. We are promised ‘head’ but given several, gradually growing more and more complex, variations. These variations center on pirouettes (with an extremely helpful and detailed breakdown of the movement) and pas de bourrees (under/over/turning), but also integrate sous-sus, tombe, fondu and arabesque. I actually could not complete the entire DVD in one practice session. I felt there were at least 3 different classes packed into it: Spotting, Pirouette, and Pas de Bourree. “Third surprise: there are ‘correction’ sections that appear almost after every exercise in the second half of the DVD. These sections are invaluable, because in them, Finis discusses what went wrong (why there was a wobble, excess of momentum, loss of balance, etc. ), and then he tells you exactly what to do to correct it. The ‘corrections’ are not listed on the DVD cover. So they come as a wonderful, and hefty, bonus. 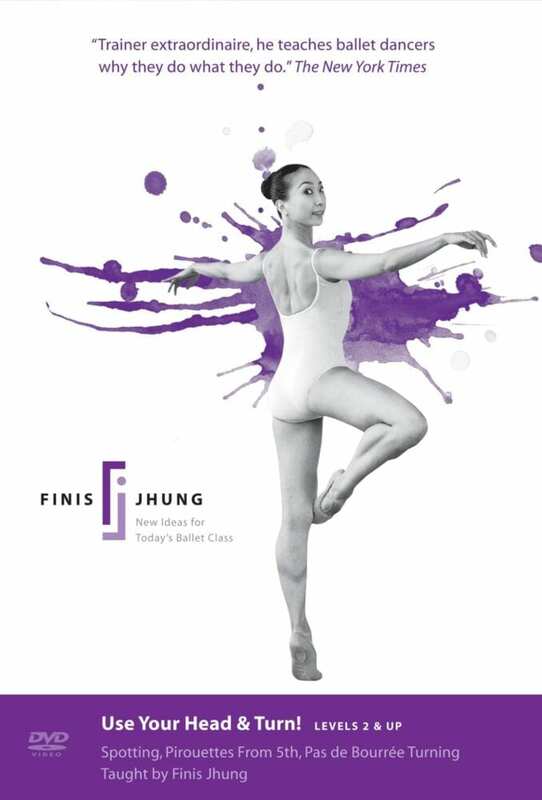 And Finis’s imagery all throughout (whether it is a “spinning top” to decode the pirouette basics, or ‘triangle’ to connect head and knees in plié, or ‘squeezer’ to remind of the solid strength at the center) are, as always, very helpful. “In the end, you will find yourself silently marveling: in the span of just one DVD, you have progressed from shuffling around to graceful full-body dancing! In sum, I see this DVD as a powerful foundation for any ‘turning’ movement and truly a MUST-have for an adult ballet beginner. Thank you, Finis! “Use Your Head & Turn! This is a DVD to love! ‘All the work for a pirouette is before you do it.’ ‘Skeleton high, weight down.’ ‘Shoulders down and back/head separate.’ ‘Both feet work together.’ ‘Don’t force arms in.’ ‘Don’t force arms in.’ !! “I can still feel my teachers pushing my supporting-side arm and shoulder around as I tried to turn. Who knew that it might be a problem? Not me! Not them! “This DVD, Use Your Head & Turn!, begins with extremely simple spotting exercises. Here is one: Go on demi pointe in first, arms in second and, without moving, snap the head sharply to the right or the left. OK, maybe I didn’t fall over but I found my body really wanting to wobble. I did it again but this time I was aware of the what and how of opposition, balance, and muscle strength. “Whoever has tried to land a perfectly balanced pirouette knows well that what seems to just happen is in actuality the result of knowledge, coordination and control of one’s body as well as numberless hours of practice. As an amateur dancer, I am still struggling with landing perfectly balanced pirouettes and get very discouraged at times. Moreover, the most important thing is to learn how to execute the movements correctly from the very first attempt, so that your body may remember each detail effortlessly. For me this meant studying with Finis Jhung at Alvin Ailey and using his wonderful DVDs for practice at home. His ingeniousness of breaking down any ballet position to allow for more control of the body by knowing what you are doing is an essential element for progress, especially for adult beginning ballet students like me. I think that Use Your Head & Turn! is the best tool I have found for learning how to pirouette. The key to a successful pirouette rests not only in hours of practice but, more importantly, in finding a teacher who can explain HOW to do it. That rare teacher is Finis Jhung, and in this video, he breaks down the pirouette from the fifth position. The three parts of this DVD gradually progress from simple to more complex exercises performed elegantly by the graceful and beautiful Sachiko Kanai. The first part deals only with spotting. Learning how to isolate and energize the head and focusing your eyes makes a big difference in whether or not your turns are successful. The second part of the DVD deals with pirouettes from fifth, broken down to the simplest movements and later combined with pas de bourrées. I found the segment where Finis explains the pirouette as a half-turn especially helpful. As a result, by the time you are asked to do a full pirouette, you are better able to do it correctly. In addition, hearing and applying the corrections Finis gives Sachiko proved very helpful to me. The DVD ends with beautiful combinations across the floor, each with the pirouette from fifth. For the adult amateur dancer like myself, who may never have a chance to perform on a stage, learning little dances like these provides enormous satisfaction.